Sitting at my desk, thinking about what to write for this week’s blog, out of nowhere the song lyric “what’s love got to do with it?” popped into my head. Hmmm. Must be a reason. So I pondered on it for a couple minutes and realized that the song lyric was a reflection of how much I love what I do. (Ok, just that one phrase, not the whole song – sorry about that Tina Turner). We’ve got a lot going on lately – teaching a couple of classes, creating a new product, working on an exciting partnership, writing a book, connecting with new clients – the list actually goes on. I could be in a state of overwhelm (definitely a familiar place for me) but I’m not. Instead I’m energized and having fun. Instead of feeling beaten down and resigned to hours of working on things I don’t really enjoy, I am energized! The reason for my positive outlook is that while we have always striven to “live the theory”; doing so has become a whole lot easier lately as everyone in the organization is really taking the phrase past theory and into reality! I love it when the power of Perceptual Style and understanding natural strengths comes out in daily life – and that’s been happening a lot lately. Nothing beats the feeling when a client has an “aha moment” – in one of our classes last week those were popping like popcorn. Makes me smile. And just yesterday we were dividing up the work load among our team and more than once someone said “let me take that one, it plays to my strengths”. Playing to your strengths may sound obvious, but the idea pales in comparison to the power of practical application. I have energy because I’m doing the things on our team that I do best. I’m not being dragged down with energy sapping tasks that just aren’t my forte. 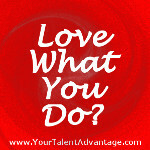 Ray Bradbury said “Do what you love and love what you do”. I couldn’t agree more. The challenge for most folks is that they overlook their own natural strengths and skills and they try to approach doing what they love – what feeds their brain and their soul – someone else’s way. That’s what makes doing what they love “work” instead of joy. So my question for you is this – are you doing what you love and are you doing it your way? This entry was posted in Entrepreneurs, Talents and tagged do it your way, Doing what you love, Energized by work, Making theory real, natural strengths, practical application. Bookmark the permalink.